PortaCell® Apple The New iPad 3 Keyboard Dock – Aluminum Smart Case Cover Stand Keyboard for AppleTM iPad 3rd Generation Wi-Fi and Wi-Fi + Cellular 4G LTE(16GB, 32GB, 64GB) + PortaCell Trademark Microfiber Cleaning Cloths! 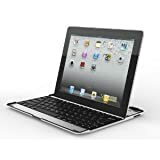 PortaCell® Apple The New iPad 3 Keyboard – Bluetooth wireless receiver, Compatible with Apple The New iPad 3 Wi-Fi (16GB, 32GB, 64GB), Wi-Fi + Cellular (16GB, 32GB, 64GB) (Not compatible with Apple iPad 1st and 2nd Generation). Keyboard is made out of high quality aluminum. Aluminum enclosure with a black keyboard and trim. Built in lithium battery (710mAh) lets you enjoy up to 160 hours of uninterrupted work time. Charging time is only 4-5 hours. This ultra versatile accessory lets you conveniently type via bluetooth connection while you’re standing your New iPad. Once you’re done using your device, just snap it in the case and carry it away while safely covering and protecting the LCD screen. Come With PortaCell Trademark Microfiber Cleaning Cloths!!! Exclusively Made and Sold ONLY by PortaCell-USA!!! • Built-in wireless Bluetooth 3.0 keyboard. • iPad display stand for easy viewing. • Built-in Rechargeble lithium battery lsats for approximately 160 hours per charge.